File under: "What do pastors do with their time?" 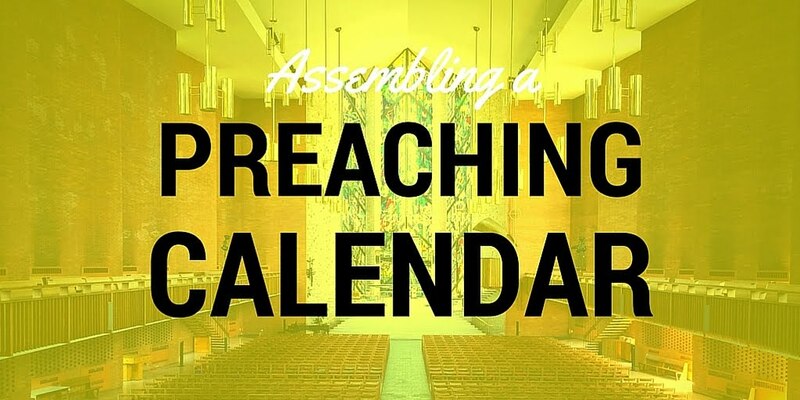 Assembling An Annual Preaching Calendar. Assumption One: The Holy Spirit is active in my life and work in ways I can't understand or identify. Assumption Two: If my whole life is bathed in prayer, then my work will be bathed in prayer, as will this process. Assumption Three: When striving to be faithful and obedient, I must first do everything I know to be right, and then what I believe to be wise, and finally what appears to be expedient. A preaching calendar is an expedient way to be wise about doing what is right. Assumption Four: This type of thing, like virtually all ministry is not done alone. I think of myself as a clarifier more than a creator. I seek to hear many voices before beginning, and seek much refinement before ending. Assumption Five: All this is flexible. How do we understand discipleship? Can we identify clear discipleship elements we should address? Who are we? How do we teach our people (from the Bible) about their identity as the church? Where are we as a body? What truths do our people need? Where am I? What is God saying to me right now? Why shouldn't I share it? At the end of step one, I should have a long brainstormed list of potential topics, book studies, theological issues, virtues, etc. which may be developed into preaching series. At the end of step two, I may have tentatively plugged some of the brainstormed series into the calendar. While I may yet move them, I now have an idea of what other series may be helpful to effectively disciple the people of our church for the coming year. As a general rule, I like to do Old Testament studies in the fall because they naturally lead up to Christmas. I like to do the Gospels after the new year because they lead into Easter. The rest of the year is a good time to look at the epistles, poetry, etc. In many churches, the "special days" are things like baptism, communion, missions reports, etc. Baptism and communion particularly are days we try to set aside to really focus on the celebration. Sometimes these days fall naturally into a series we are doing, and sometimes they need to be placed as a stand-alone between series. Obviously, there's more to it, but this is just a rough outline, and all this is just the opening activity. The next step is really where the hard work starts as I break down each series, determining the key teaching points and biblical truths which will form the main ideas for each week's sermon. But that's another post for another time. Anyone Can Lead A Small Group. Here's How.